We have done holiday gift guides in the past and focused on larger, more expensive golf items. This year we will touch on some of those, but will primarily focus on smaller gifts and stocking stuffers. So if you are not sure what to get that golfer in your life, hopefully we can help make that decision a little easier for you. If you have other gift ideas you would like to mention, feel free to let us know in the comments after the article! Be sure to read the entire article (or at least the last paragraph!) as we have a little contest for you! This is always the ‘old standby’, I am sure most people out there with a golfing dad has bought a dozen golf balls as a gift on numerous occasions. If your dad generally plays ‘whatever golf ball he finds’ you could surprise him with a dozen ProV1 golf balls, at a discount price. How, you say? Check out our review on KnetGolf, a company that resells refinished or recycled golf balls. You can get top quality balls for half the price, and I really could not notice any difference…performance wise or cosmetically. So if you are looking to surprise that golfer in the family with some pricey golf balls…without breaking the bank, that route is a great option. A big bag of wooden golf tees is another traditional gift for a golfer. Rather than boring that golfer in your family with a $5 bag of 100 wooden tees in their stocking, check out our Evolve Golf. They offer a couple varieties of environmentally friendly, reusable golf tees. Not long ago we reviewed the Epoch and Vireo golf tees. Both can be had for about the same price as a large bag of wooden golf tees, but will last a heck of a lot longer, might eek out a few more yards and you won’t be killing any trees in the process. So you have a lady golfer in your life, and have no clue what to get her. Well, Sassy Golf has a real simple option for you, a decked out golf glove designed by a woman for women. Elizabeth, over at Sassy Golf, grew tired of wearing a man’s golf glove sized for a woman. So she put together some cute glove designs and has been selling her Sassy Golf gloves like crazy! There are a number of design options available, so you have another opportunity to be a little creative. The gloves can be had for just under $20 and include a boutique style gift pouch…saves you some wrapping time perhaps? After you order one of these gloves for the golfing woman in your life, be sure to follow Sassy Golf on Twitter. 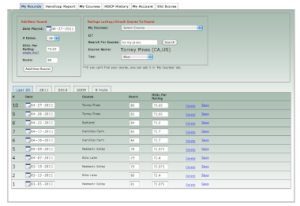 Is your golfer looking at a cold winter season, stuck indoors? There are a number of practice golf balls on the market that can help ease the winter golf blues. We have reviewed a few of the options in the past, all of which are great options, let’s have a look at see what might work best for your golfer. Almost Golf makes a soft, foam like golf ball that looks a traditional golf ball and almost feels and flies like one. It could be used indoors for chipping or hit into a net in your garage. Another option, if the golfer has a little less space is The Floppy. The Floppy is more of a bean bag type material that can be used for any number of short game shots around the house. It works great off carpet, and unless you are hitting it toward that antique vase, it should be relatively safe around the house. Now, for the golfer that is in a little warmer weather and can hit some balls outside, your best bet is the Birdie Ball. The Birdie Ball is the most realistic feeling of the practice balls we have tested, but flies a much shorter distance. So for someone with a small back yard, you can still take pretty big swings and not worry about breaking any windows…well…hopefully not! 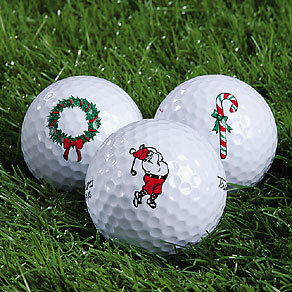 All of these practice balls can be had at stocking stuffer prices, and would be a great gift for the avid golfer. How many people out there have spent hundreds of dollars on golf training aids, only to find them collecting dust in the basement? The Pure Ball Striker is a very simple, yet very effective training aid that will help you develop lag pressure in your swing. It’s as simple as a little piece of rubber cut to fit over your golf grip. You place the meat of your lower hand (right hand for right handed golfers) on the PBS and feel the club head lagging against that finger through your swing. It’s something you can use anywhere and anytime you are practicing. Coming in at under $15, it definitely falls into that stocking stuffer category. Here is a nice video review of the product. Now, what about golf clubs? This is a tricky subject. If the golfer in your life is an avid golfer, he or she probably has a very good idea of what type of club fits their game and what they want in a club. Most likely they would want to demo a few sets of irons or try out a variety of drivers before setting on a single club. This makes it difficult to choose a specific golf club for such people. In this case, it may make sense to simply get them a gift certificate at a local pro shop. Maybe make it a little interesting, buy them a custom club fitting at a location with a launch monitor or motion capture technology (TaylorMade Performance Lab or MotionGolf). If you still want to stick with a golf club, check out our used golf club buying guide on oobgolf. Win some Golf Stocking Stuffers! Okay, so hopefully you got some good advice there, and have enough time to order some little stocking stuffers for that golfer in your life. Now, if you are really tight on cash, and still want to get that golfer a pretty cool gift, have no fear, The Deep Rough has put together a little stocking stuffer contest for you! We will be awarding four prizes over the next couple of weeks. Comment on a post on The Deep Rough (be sure to leave a valid email address) – We will select one comment posted after December 7th 2009, on December 11th. There is no limit to the number of entries, but please keep in mind that any that are determined to be spam will be deleted. So please, make your comments meaningful. We will select one random person who tweets the message above on December 16th. Again, no limit to the number of entries. Subscribe to our Newsletter – We will randomly select one new subscriber to The Deep Rough as of December 18th, make sure you have entered a valid email address and confirmed the validation email. Lastly, for the putter, we will put all of the comments, tweets and new newsletter subscribers into a big pool, and randomly select one entry. 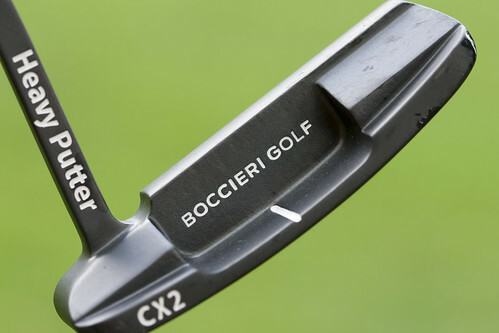 The Heavy Putter Mid-Weight CX2 could be a nice little ‘slightly belated’ Christmas gift for someone! Enter early, and enter often! Enjoy! Happy Holidays! Which are the Contest we really have what are the advantages i would like to know the same. Additional gift ideas for stylish golfers – check out the patented head covers, hot belts, and great stocking stuffers from Sumi-G. http://www.sumi-g.com. Thanks, good gift ideas… made my son read it so I dont get socks again this year. Great idea John! Good luck everyone, looks like pretty good odds at this point! My dad generally plays whatever golf ball he finds and he would surprise us with a dozen ProV1 golf balls. I watched that Pure Ball Striker video and feel more confused than before. What the hell does it do and what the hell did he just say? My thanks to oobgolf for the link to your site and thanks for the contest. Free is good. I thought I was hitting the ball solidly in the past, then I worked with this and also read up on this article (http://www.golflagtips.com/focus-on-pressure-points-to-feel-lag/) and now I feel like I really can compress the golf ball and control it better. Have a read through the comments on that post as well, lots of great info. Not bad for a $15 item, some reading and a lot of practice. Just to let everyone know, Jim won the December 11th contest, and will be receiving a dozen golf balls from KnetGolf! There is still plenty of time to win some other great prizes! I can never play or watch enough golf! The epoch tees are amazing. I used to use the zero friction ones but found these to be even sturdier. Now, the frustrating part of my drives off the teebox is losing the tee on the teebox. I found http://www.grayfoxgolf.com/ and it has a TON of great gifts for golfers. I highly recommend it! I definitely like this list you’ve made. Great ideas, and love love love golf. Thanks again for the birdie balls and for throwing in the floppy ball. I’ve always wanted to try them out! No problem Jeremy, let me know how you like them! I had a few floppy’s lying around, figured I would toss one in! And yes, last day of the contest today, I will announce the winner of the Heavy Putter Christmas morning! Hey George, congrats on winning, hope you love the putter! Congrats on the new job, keep in touch and let us know how it goes with the new club and the new job! Just recieved the Heavy Putter like it’s feel, will keep all posted on how it performes on the greens once I’m able to try it out. Snow outside is keeping the practice indoors for now. Thanks Again! The first time I have ever won anything, really looking forward to comparing this putter with my Odyssey.